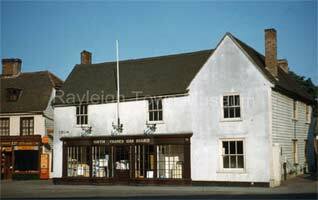 Rayleigh derives its name from the Saxon words ‘raege’ (a wild she goat or roe deer) and ‘leah’ (a clearing). When William the Conqueror invaded England in 1066 he ordered the building of a network of castles. Robert Fitzwymarc who held the ‘Honour of Rayleigh’ before the invasion was one of few allowed to retain his lands. It was his son Sweyne who built Rayleigh’s motte & bailey castle the only Essex castle mentioned in the Domesday Book. 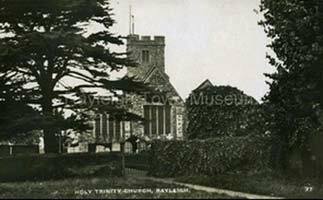 An area of religious devotion since Saxon times, Rayleigh’s distinctive Parish Church at the top of the High Street dates mainly from the Perpendicular Period (14th to 16th centuries). In 1555 two Protestant martyrs were burnt at the stake for refusing to deny their faith and a memorial was erected to their memory in 1908 at the top of Crown Hill. In the 19th and early 20th centuries a branch of the Peculiar People religious sect was prominent in the town. Rayleigh was an important town on the Rochford Hundred Adjoining Roads Division of the Essex Turnpike Trust set up in 1746. 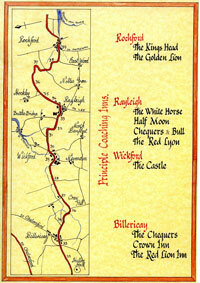 The ‘King’s Highway’ from Wickford passed the along the London Road and at the top of London Hill the highway branched into two, one route to Hockley & Rochford and the other to Hadleigh & Leigh. Would you like to find out more about our town’s history such as the Regal Cinema, the Rayleigh Rockets, the building of the A127 in the 1920’s as well as taking a look at our collection of Rayleigh maps dating back to 1576. I would suggest a good way to start is by a visit to Rayleigh Town Museum.